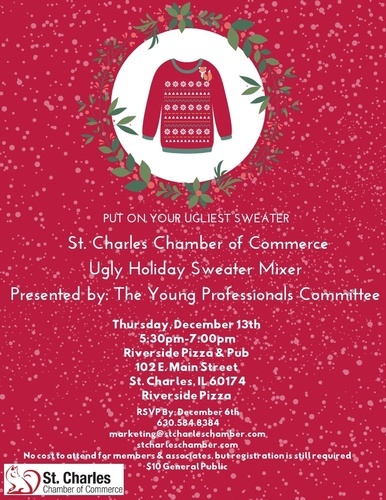 Don't let the title of "Young Professionals" shy you away because ALL are invited to the Chamber's Young Professional Ugly Holiday Sweater Mixer on Thursday, December 13th at Riverside Pizza and Pub from 5:30pm-7:30pm. You don't want to be the weirdo that wears a "boring sweater" so make sure to wear something tacky yet flashy! There is no cost to attend for chamber members, but registration is still required.